The Tower Treasure by Franklin W. Dixon – I had to read this for 1927 given the fact that I vividly recall trying to read every Hardy Boys and Nancy Drew mystery published when I was a kid. 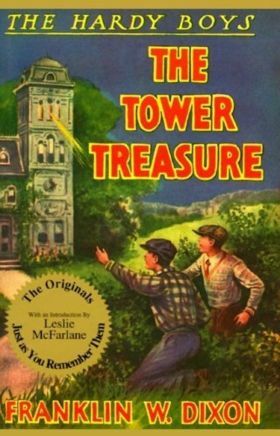 The Tower Treasure was the first Hardy Boys mystery published and set the stage for the multitude of teen-based mystery serials that followed. In The Tower Treasure, Frank and Joe become involved in a rash of robberies in their hometown, Bayport, one of which involves their best chum, Chet Morton. Frank and Joe are just getting their detective chops here, wanting desperately to be just like their Dad, the renowned detective and former NYC police officer, Fenton Hardy. The boys follow clue after clue while searching for the culprit who swiped a treasure in jewels and stocks from the local rick folk, the Applegates, who live at The Tower Mansion. Along the way, several chums help out, the boys frustrate the efforts of an inept detective wannabe, Oscar Smuff, and eventually find their way to the treasure, only to narrowly escape certain death, or at least a little discomfort when a nasty looking hobo locks them in a water tower. The Hardy Boys is just one series written by the publishing group known as the Stratemeyer Syndicate, founded by Edward Stratemyer. This group was the first publishing unit known to direct its work at children, and its progeny include the Hardys, Nancy Drew, The Dana Girls, Tom Swift, The Rover Boys, and The Bobbsey Twins. Re-reading this book after so many years was somewhat of a silly treat. The plot and the writing is very simplistic, and the good luck and coincidences experienced by the boys are almost too much to believe. However, for children reading this in the 20’s, 30’s and even into the 60’s and 70’s, the Hardys were It. Every boy wanted to ride motorcycles like Frank and Joe, and every girl wanted to be Callie (Frank’s sweetheart), or Iola (Joe’s girl). If you were a Hardy fan in childhood, re-read a few of the original books for a quite afternoon reminiscing on the early days of your mystery reading when there were few corpses and certainly no serial killers. 5 out of 5 catalog cards for old time’s sake….